Public notice is hereby given that the RM of Sherwood No. 159 intends to adopt a bylaw under The Planning and Development Act, 2007 to amend Bylaw 16/16, known as the Official Community Plan Bylaw. Purpose: Bylaw 01/18 intends to add the Concept Plan for the Varsteel Ltd. Industrial Development as a Schedule to Bylaw 16/16. The Concept Plan intends to provide a detailed development framework for the area within the bold dashed line shown on the map below (Proposed Parcel A). Affected Land: The land to be affected by the Concept Plan is legally described as Proposed Parcel A, SW 16-18-19-W2. Reason: To be consistent with the OCP (Bylaw 16/16) Policy 3.4.2. Public notice is hereby given that the RM of Sherwood No. 159 intends to adopt a bylaw under The Planning and Development Act, 2007 to amend Bylaw 10/91, known as the Sherwood – Regina Planning District Zoning Bylaw. 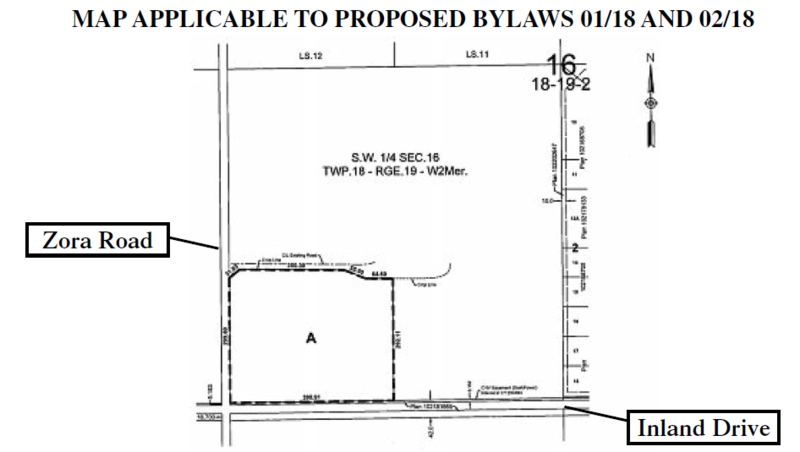 Purpose: Bylaw 02/18 is intended to rezone the area within the bold dashed line on the map below from A-Agriculture Zone to I-Industrial Zone. Affected Land: The land to be rezoned is legally described as Proposed Parcel A, SW 16-18-19-W2. Reason: To allow the appropriate zoning to accommodate subdivision and development of a proposed warehouse and office building at Proposed Parcel A, SW 16-18-19-W2. Public Hearing: Council will hold a public hearing on Tuesday, April 17th, 2018 at 5:30 pm in the Council Chambers at the RM of Sherwood Office to hear any person or group that wants to comment on the proposed bylaws. Council will also consider written comments received at the hearing or delivered to the undersigned at the RM of Sherwood office before the hearing.